The last few days have been like a whirlwind! I’ve been so busy with drumstheword.com. I will be adding some new drum lessons very soon. I’m in the process of learning how to use Sibelius to write drum notation. I would much rather write all my drum exercises using this software rather than by hand as I have been doing so far…it just looks more professional, don’t you think? I’ll have a think a bit more me thinks but I imagine they will all be added over the next months anyway. Let me know if you guys can think of any other drum lesson subjects, or indeed, if you have any of your own suggestions. I’d be happy to write lessons specifically for you! Thought I’d give a quick drum lesson here today as well. Its based on a forum entry I found a couple of days ago about simple triplet based drum fills. I suggested to the forum that they might include the bass drum as part of their fills as the only suggestions previous were only talking about hand to hand ideas. The suggested sticking for each can be altered depending on your own preferences but these are the ones I use (note: the left hand is used if ending the lick to enable the right hand access on the next down beat). The ones that use two bass drum notes are particularly cool and tricky at the same time. You could use double bass drum to execute them but I think its always a good idea to try and use the one bass drum. 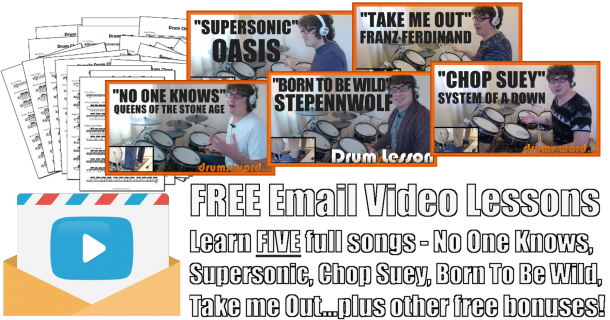 You might recognize the single bass drum ideas from drummers such as John Bonham and Steve Gadd. Those guys loved the old triplet patterns! Finally, you don’t have to use these licks in triplets only, you could play them through 1/8th, 1/16th or 1/32nd notes for an added challenge and pleasure. Yay!